There is an old saying that states “Sticks and stones may break my bones, but words will never hurt me”. I’m willing to bet we’ve all disagreed with this at some point, and especially when it comes to diabetes. Many advocate for the importance of using non-stigmatizing, inclusive and non-judgmental language when speaking about or to people with diabetes. For some, they don’t care, others care passionately. Where do you stand when it comes to “person with diabetes” versus “diabetic”, or “checking” blood sugar versus “testing”, or any of the tons of other examples? Let’s explore the power of words, but please remember to keep things respectful. I am very particular about the language I use when referring to diabetes or the people who have been diagnosed with it. Start with the word that will likely get the most attention today, to me diabetic is an adjective to describe a disease, not to describe a person (who is not, by definition, a disease). It is not a noun. I expect to see a scientific paper confirming that with better insulins and access to treatment, diabetic retinopathy is on the decline. I don’t expect to tick (or want to accept) a box on my insurance or driver’s licence form that categorises me as diabetic. It is not that I’m offended when people use the term diabetic. And I certainly don’t judge others for preferring it or simply having no opinion on the matter. People are free use whatever words they want to describe themselves. However, for me, it’s about seeing people with diabetes as individuals not as a collective statistic. It’s about reducing stigma on a disease which already carries far too much of it. I feel judged enough as it is without testing my blood sugar to find out it’s bad and that I can’t control my diabetes. I am never high or low. But even when I manage my diabetes to the best of my ability, my blood glucose levels are sure to be outside of my target ranges at some point on most days. I also don’t want to be told that I suffer from diabetes. Yes, diabetes makes me suffer at times, but certainly not all the time. Besides, how on earth can someone other than me decide if I am suffering or not?? And don’t even talk to me about non-compliance, which implies fault on the part of the individual if expected or desired results are not systematically obtained. I could go on and on, but I’ll get off my little soapbox now. What I hope for in using less stigmatising and more person-centered language is support in dealing with this difficult and frustrating disease that nobody ever choses. Using language that underlines difficulty, guilt and helplessness will neither help to raise awareness about diabetes nor support people who live with it. If health care professionals, insurance companies and media were reminded that we are, indeed, individual people who have different backgrounds, preferences, views, hopes and experiences then we each might feel more empowered and capable of dealing with the crap that this disease throws at us. Ultimately I believe that the language we use can improve our health and wellbeing. This entry was posted in Diabetes and tagged #dblogweek, diabetes, language, stigma on May 18, 2016 by Andrea. Last week, I developed a very sharp pain under my right foot. One day there was no pain or any reason to think there would be a pain developing. The next morning as I put my foot on the floor getting out of bed, the pain was as sudden as it was intense. I made an appointment right away with my GP. She examined my feet, prescribed an anti inflammatory gel, sent me for x-rays and gave me a referral to see a physiotherapist. All expected with this type of doctor visit. But in addition to seeing my doctor, I also had a look online as to what could be causing this type of pain. I use the internet a lot for gathering health information through scientific journals and both diabetes related, autoimmune related or just general health websites. I have participated for years (read: since my diabetes diagnosis in 1997) in online forum discussions on diabetes and then Celiac disease. I have followed blogs, joined facebook groups and my twitter account was used as a way to keep up with diabetes news long before I started being more active on the diabetes online community. I trust my own health literacy and digital literacy skills enough to not worry about warnings against consulting Dr Google. I know how to find trustworthy sources of information and how to weed out dodgy or sensational health claims. I would also rather have as much information as possible about a health issue so that I can then sort through it and see what might apply to my situation. So when my foot started hurting I asked Google for some help. I started with looking up plantar faciitis since it is a common injury for runners and the pain seemed to be in the right spot. From there, my searches included stress fractures (which I have had before, because of low bone density around the time of my Celiac diagnosis), and heel spurs (with which I have less experience but there were links to info on bone spurs on some of the other foot injury pages). That’s when I stopped looking though. Not because I had self diagnosed anything – that was not the objective. But because when I got to the Risk Factors section of the page, right in the middle of the list, highlighted in blue because of the link: Diabetes. That’s when I swore at my computer. Or rather, at my diabetes. I am fairly certain that this pain in my foot has nothing to do with 18 years of living with diabetes, but I felt like diabetes was mocking me from the page of WebMD, saying, “I could be the cause of anything”. There is enough judgement and stereotyping in diabetes that we don’t need that from risk factor lists on the internet! Sometimes, though, when you know there is so much diabetes stigma out there and I’m expecting to have to brace against it, it’s hard to draw the line between judgement and concern for appropriate care. I hate that when you have diabetes, almost any medical issue can potentially be linked to it, or at least the diabetes cannot be excluded from the possible causes and certainly can have an influence on how the problem is treated and how well/how fast it is fixed. health care professionals who encourage me to ask and happily answer questions I might have. I hate that health care professionals can be sometimes blinded to other causes or symptoms because the diabetes gives an easy explanation for some medical conditions. foot problem are trying to get to the root of it rather than blaming the ‘betes. I hate that it is generally assumed that things will heal more slowly because of diabetes (and that not all HCPs bother to look at recent personal A1c history when making this statement, or work with the patient to help make sure that blood sugar levels stay as stable as possible during the treatment). I hate that my HR department at work assumed I had a diabetes complication when I asked to work part time from home while my foot hurts and I have physio appointments twice a week. because “my dad has diabetes too and I know how important it is to take care of your feet”. Now that I have seen the GP, the radiologist and the physiotherapist, it would seem that I have some mild plantar faciitis plus tendonitis on the side and bottom of my heel. Nobody has blamed this inflammation directly on diabetes but the fact that we cannot pinpoint what has caused it makes me feel like it leaves that D-door open just a tiny bit. Perhaps I need to have a look at my own level of diabetes stigma. 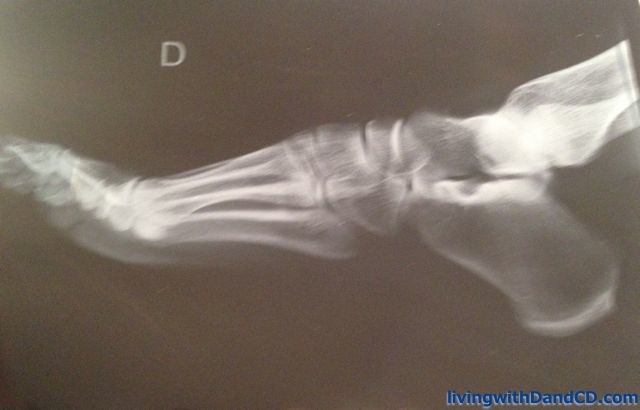 But I do have a lovely picture of my right foot, with no heel spur, either related or unrelated to diabetes. This entry was posted in Diabetes and tagged diabetes, stigma on March 23, 2015 by Andrea.